There’s nothing quite like Chinese New Year without the sharing of kam, in the form of mandarin oranges. Translated as “gold” in Cantonese, kam signifies the abundance of good fortune and wealth, which is why bags of mandarin oranges have long been a symbolic gift in this occasion. 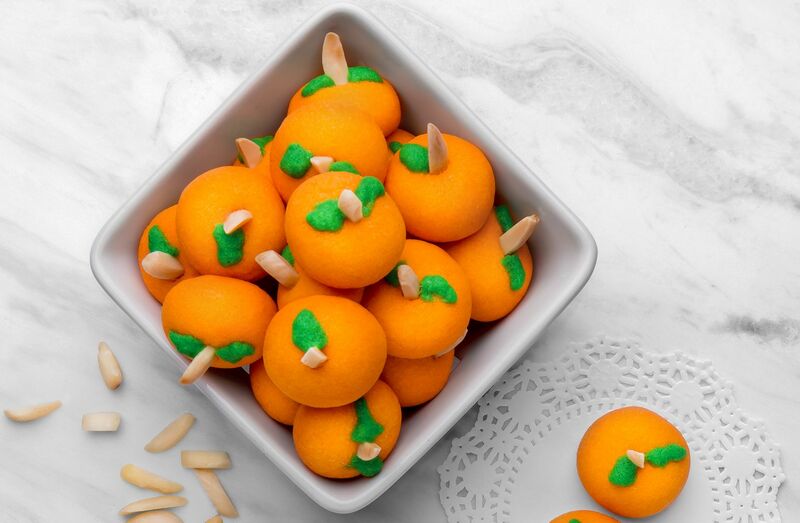 Now, prosperity is also just a few bites away with these melt-in-your-mouth Lucky Tangerine cookies. Recipe and photo courtesy of SCS Butter. Cream together butter and castor sugar until light and smooth. Add in egg yolk gradually. Sift together flour, salt and ground almond then fold into butter mixture. Divide dough into 40g to mix with 1tbsp of salted butter and 1/8 tsp of green colouring. Transfer into a piping bag. Mix balance dough with ¼ tsp of orange red colouring. Take 7g of dough and roll into ball shape, stick one almond strip to the center of side of almond strip. Bake at 150°C in a preheated oven with top and bottom heat for 25-30 minutes or until done.